We accept gently used items: clothes, decor, small appliances, and furniture. Stop by the store for our monthly specials and events! If you have a flare for fashion, enjoy designing displays, organizing donations, can identify treasures, enjoy meeting new people and work well on a team, the Thrifty Boutique would love to have you join them! The support offered by volunteers in our Thrift Store is a vital part of Hospice. Joining our team promises to be full of opportunity, rich with creative possibilities and personal connections. 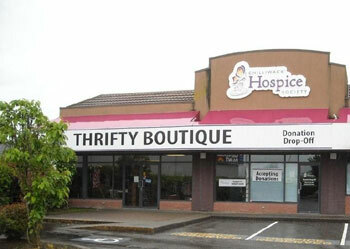 If you feel this may be a fit for you, please contact (604) 846-2226 or email thriftyboutique@chilliwackhospice.org. You may also complete an application form and send it in confidence to thriftyboutique@chilliwackhospice.org or by fax: (604) 846-2225.